Whenever members of my family get together, we eat, and if we’re going to be visiting each other for a few days, we count up the meals in advance and start planning what we’ll cook and eat together (we have already, despite having more important things to do, begun emailing a little bit about Thanksgiving). My Dad doesn’t do too much cooking, but when we gather at my parents’ home, he plays an important role in our food conversation by telling us what’s coming from the garden or what he’s got stocked in the freezer, also letting us know when some food is producing at oppressive levels (at the moment, ripening peaches cover every flat surface in the kitchen, the wood stove, and one spare bed) or whether we need to clear out last year’s frozen whatever-vegetable to make room for this year’s crop. It’s kind of like walking into an episode of Iron Chef, the one-ingredient cooking challenge, except I get lots of ingredients, and no stop clock. It’s great. At my parents’ last week, one of the products to use was rhubarb, and my Mom had already emailed me a recipe from the New York Times in anticipation of my visit. 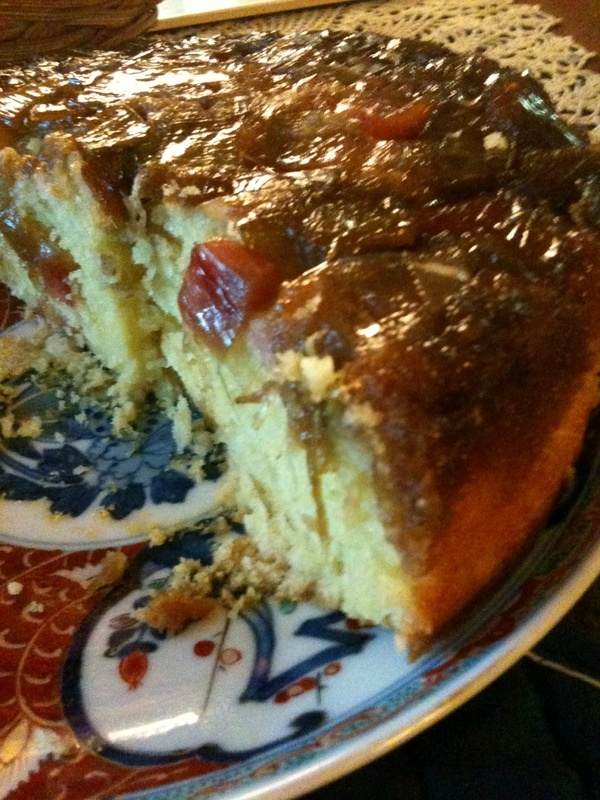 I am a big fan of upside-down cakes, as you might have noticed; I’ve posted recipes for ones with cherries and pears (with a terrible picture), though I think my favorite is still this apricot upside-down cake, which I picture here. They are usually pretty easy, always moist, and have that great caramelized sugar-crust edge. I have to admit, this one is a bit fussier than what I would make just for my own family, but for my Mom — who taught me how to bake — anything. And besides, it’s completely delicious. 1. Heat oven to 325 degrees. Line the bottom of a 9-inch springform pan with parchment paper. Butter the paper and sides of the pan. Wrap two layers of foil under the pan, and place it on a buttered baking sheet. 2. In a medium bowl, mix rhubarb, cornstarch and 1/2 cup granulated sugar. 3. Mix the brown sugar and 1/2 stick butter in a pan over medium heat. Whisk until smooth and bubbling, about 2 minutes. Sift together the cake flour, baking powder and salt. 4. Whip 2 sticks butter in a mixer with a paddle attachment for 2 minutes. With your fingers, blend the remaining 1 cup sugar with lemon zest until the mixture is uniform in color. Cream together with the butter at medium-high speed until it is light and fluffy, about 4 minutes, stopping to scrape down the bowl halfway through. Add the vanilla and mix well. Add the eggs, one at a time, mixing well after each addition. Mix in the sour cream, then the lemon juice. (It’s O.K. if the mixture looks curdled.) With the mixer set to low speed, add the flour mixture, 1/4 cup at a time, until well combined. Scrape down the mixer bowl in between the additions. 5. 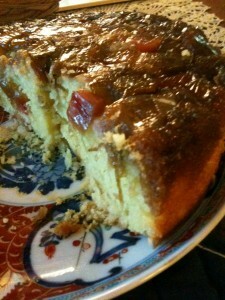 Pour the brown-sugar mixture into the cake pan, then spoon in the rhubarb and its juices. Spoon in the batter so it covers all of the rhubarb. Smooth out the top. 6. Bake for 1 hour and 15 minutes, or until the top of the cake is firm to touch and a toothpick stuck in the middle comes out without any large, moist crumbs. 7. 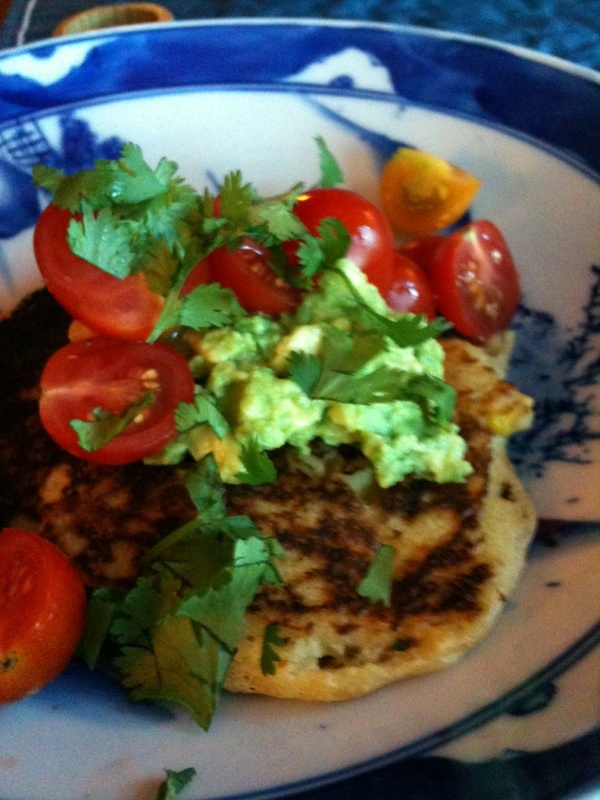 Place the pan on a wire rack, and cool for 15 minutes. Run a knife around the cake, place a plate on top of the pan and turn it upside-down. Release the cake from the pan while still warm or else it will stick. When my husband and I decided to get married, I told him I could imagine making a life in his native San Francisco as long as we spent one week every summer somewhere I wouldn’t need to wear a scarf. That means, happily, an August week in Northwest Connecticut, visiting my parents, and that also, very happily, means corn. Usually, we’re eating my Dad’s corn, but this year the crop failed so we’re getting it from local farm stands. My Dad likes the one the First Selectman sets up at the end of his driveway (presumably because he can get caught up on local political talk); my Mom (and I) like the bigger one that also offers fresh, homemade mozzarella. Either way, with this much corn around, you are bound to have leftovers, and this recipe is my new favorite way to use them. Don’t be put off (as I nearly was) by the somewhat fussy step of blending and straining some of the corn with milk: it makes a difference. You can eat these the way my kids do, drenched in maple syrup (and when the syrup’s homemade, I won’t stop them), but you can also eat them savory, as I’ve pictured, with guacamole and fresh tomatoes. It’s summer on a plate. Our CSA* resumes today after its winter break, and I am unreasonably excited. It’s not like we don’t have access to excellent produce in the winter. We visit a Sunday farmer’s market just two blocks from home, so we can track the winter’s progress from pear to pomegranate. I chat with the egg farmer about how her “ladies” hunker down in their coop when it rains. I buy honey sticks from neighbors whose bees live in the community garden, four blocks away. But, still; the CSA means spring to me. Despite twenty years living in a state where something can always be harvested, despite witnessing that winter harvest every Sunday at the market, I still, deep down, expect a winter shutdown. Winter is for seed catalogs and spring, now, is for the first sprouting seeds. I love the CSA because of all the ways it differs from choosing food at the market. I don’t get to choose green d’anjou pears over red, I don’t get to pick out the easy-peel satsumas instead of minneolas: I take what they give me and figure out what to do with it (a task really made easier by the fact that our CSA share always comes with recipes; I think many others do, too). We’ve learned that we all really love agretti and that cardoons are an interesting change of pace. I love the schedule (a midweek collection fits perfectly with my weekend market habit) and the pick-up location (my sons’ school) can’t be beat. As a lucky bonus, our CSA farmer happens to be a terrific writer, so the vegetables come each week with a newsletter with his musings about dirt, windbreaks, strawberries or whatever else strikes him that week. I look forward to the newsletter each week almost as much as I do the vegetables. 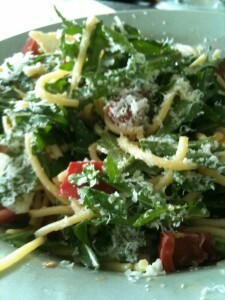 Are you signed up for a CSA? I’m curious to hear when it begins, and how it affects how your family eats. 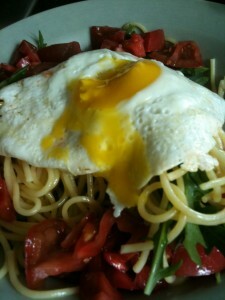 I’ll start posting some of our favorite CSA-inspired recipes in the coming weeks. And if you’re not signed up for a CSA, you can look for one in your area by checking out Local Harvest. This is not really a post about okra (though I do have a simple recipe below) but a reminder that when kids are involved in your meals, they should be involved in your meal planning. My husband and I know this, of course, and we do involve them to a certain extent — we ask whether they want pasta or rice; we let them vote on cooked spinach vs spinach salad; we bring them to the farmer’s market and let them pick things out. But lately we don’t often go to the grocery store with them, and that was site of this weekend’s revelation. Tony and Ben had snuck out secretly to get a Christmas tree while Eli and I were at a birthday party. Decorating a Christmas tree requires eggnog, of course, so the guys headed off to our local market, which you enter through the produce section. Ben spotted the okra and remembered he loves it. Years ago, a friend made an Indian-spiced fried okra dish that he devoured, and Ben still talks about it (I remember it simply as the first time I enjoyed okra). But okra doesn’t show up in our CSA box and I don’t seek it out at the farmer’s market. Frankly, I don’t love it, but that shouldn’t be the most important factor now that the kids are getting older, and especially not if we want them to try new things. Plus, it is incredibly easy to cook. Tony gets the credit for this simple recipe, which was delicious and different and everybody enjoyed (except Eli, to whom I suggested he could learn to like it). 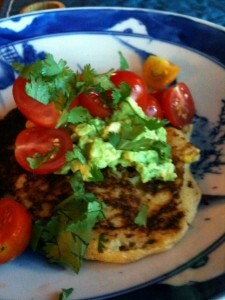 It inspired an entire Indian feast, with a simple curry of potatoes and tofu, papadum, and lime-mango chutney. More than that, it inspired us all to think we might possibly be taking the first small steps away from the kids narrow food choices of the last couple years. 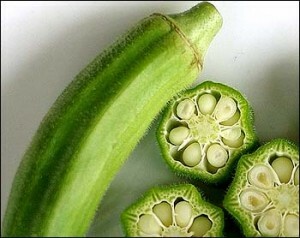 Wash and trim the okra, then slice it into 1/2″ rounds. Fry it in a bit of olive oil until it has started to brown and crisp around the edges, about 6-10 minutes. Sprinkle with a mixture of ground cumin, coriander, turmeric and a bit of salt.